Daylily growers have reported delayed appearance of visible rust on plants that had been exposed but remained symptom free for a prolonged period of time, although in suitable environmental conditions pustules can appear in less than two weeks. In experiments at the University of Guelph, Ontario, Canada, daylilies that were inoculated on July 18, August 7, August 14 and finally on August 21 did not develop visible rust until October 6th. Thus at least seven weeks passed between exposure to rust spores and the appearance of pustules. Two possible ways this could happen are that the system of fungal threads (mycelium) inside the leaf following spore germination and infection is inhibited in its development by environmental conditions such as high or low temperatures making it slow to produce visible rust, or spores remain viable yet inactive on the plant until conditions are suitable for germination. Table 1 indicates the result of tests to determine the latent period (the time between exposure to spores and the appearance of visible rust) in different conditions. (The detached leaf assay method involved incubating inoculated 4 cm. long daylily leaf sections in Petri dishes on filter paper with gibberellic acid). TABLE 1. Latent period and uredial production under different temperature and light conditions using detached leaf assay for daylily rust. To determine how long rust spores (urediospores or "summer" spores) may survive in the environment, spores were placed in sealed vials and kept on a laboratory bench at 20�C/68�F. At intervals detailed in the following table (Table 2), spores were removed and used to inoculate daylily leaf segments and those leaf segments subsequently evaluated for the number of resulting pustules. 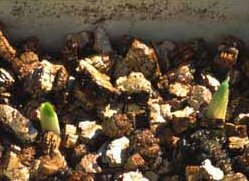 After 34 days, more than half the spores were still capable of infecting daylilies. The conclusion reached was that more research is needed to determine how much longer the spores would have remained viable, and also how different conditions (e.g. different temperatures) would affect spore longevity. TABLE 2. Viability and infectivity of daylily rust spores after storage at 20�C/68�F. The winter survival of daylily rust was studied in Japan. In this experiment, divisions were collected in early winter from a population of deciduous daylilies that had been heavily infected with rust. New growth that emerged in spring was free of infection. 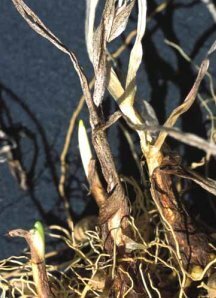 This indicated that the mycelium, or fungal threads, did not persist in the crown or resting buds and that urediospores (summer spores) on dead foliage from the previous year failed to infect the new growth. It was suggested, therefore, that new infections of deciduous daylilies in Japan most likely originate annually from aeciospores produced on the rust's alternate host, Patrinia. Divisions each with dormant bud and crown were collected in December 2001. The divisions were washed and half were cleaned of dead foliage. Dead rusted foliage was not removed from the others. 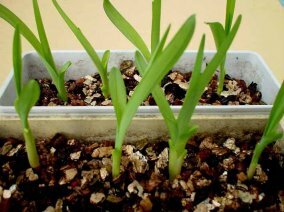 Both treatments were planted in boxes of vermiculite, those without old foliage kept in a growth chamber, those with old foliage were kept outside the greenhouse. The new growth of both treatments emerged and remained free of daylily rust. It is important to note that the above experiment was conducted on divisions of a deciduous (dormant) daylily in which the foliage dies down naturally late in the year. 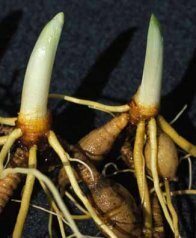 Where evergreen daylilies are able to retain enough living tissue the disease may persist from year to year without the alternate host, Patrinia, as already happens in warmer climates of North America. Ono, Y. 2003. Does Puccinia hemerocallidis regularly host-alternate between Hemerocallis and Patrinia in Japan? J. Gen Plant Pathol 69: 240-243.